Are you a sea person or a hill person? Well, I love the hills, and with it also comes my love for trekking. India has so many great places where trekking can be a welcome change from the regular routine of the 9-5 work. Even if you’re not really interested in trekking, it’s something you should definitely try the next time you are in the hills – and I am sure you won’t regret it. And one thing you would need when planning to a trekking or a camping trip is a good backpack bag. And a backpack is not something you can buy every time you go on a trip. At the risk of sounding stupid, let me tell you this – there is something special when you find the right backpack. I bought a great backpack 4 years ago and I have taken it on countless trekking trips in the Himalayas, to Europe and even to the south of India. So I mean it when I say – it is important for you to pick the Best Backpack for Trekking and Camping in India. If you are planning to go on a long road trip or a hiking trip then a backpack is one of the very first pieces of gear you would need. Considering you will be wearing it for many hours you should make sure that you pick the right backpack for yourself. And let me also tell you this – good backpacks for trekking/hiking are not cheap. But it’s an investment to add to your hiking gear list that will last for years. And recently, I was helping a friend buy the perfect backpack bag for her when I decided to write this backpack bag review. One of our big goals here at TheActiveIndian.com is to make your life easier when it comes to buying outdoor, fitness and sports gear. In a hurry and don’t want to go through a detailed review? Here are our top three backpack recommendation that you can get in India. In case you’re in a hurry, here are my top three recommendations for the best backpack for trekking and camping in india. Still confused about which backpack is right for you? 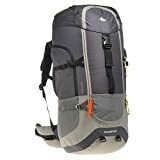 Let me help by providing detailed reviews on the best backpack for trekking and camping that I found in the market (and the ones you can buy online). These reviews will definitely help you gain awareness and understanding of the best features, pros, and cons of each backpack. Below is the table that shows all the trekking/camping backpacks covered in this review. Now let’s have a look at the detailed reviews of each of the backpack covered in this article. Quechua is a popular brand in the backpack space. It’s known for its products for hiking, trekking, mountaineering, and adventure sports. This Forclaz 50L backpack is a simple, lightweight and functional bag with pockets and easy access. Practical for both occasional hiking and traveling, this bag is made for Trekking “backpacker” style traveling on marked trails for several days. 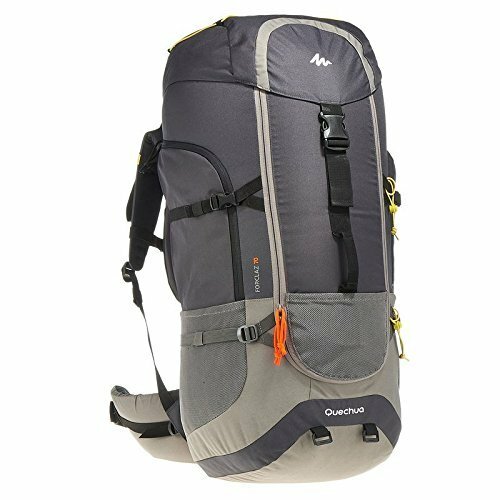 This backpack has a 50L capacity, which makes it ideal for a 4-5 days trekking/hiking/camping trip. In case you’re looking for a backpack for 7-10 days, choose the 70L version of this backpack. It weighs about 1-1.5 kgs, which is quite light when it comes to backpacks. Due to its small size, you can easily fit it in the cabin baggage in flights. It has a metal frame inside which makes it durable and easy to carry. It has two pockets on the sides and one on the front which makes it easy to access some stuff (such as tickets/papers/goggles). Compartments: 3 external pockets, 1 internal pocket, and 1 belt. Pole-loop. bottom access and compartments. Capacity: Volume 50literss, Weight ~1.5 kg and ideal for a camping or trekking trip of 2-7 days. This Wildcraft orange rucksack bag is one of the bestsellers trekking bags online. It has a 45-liter capacity which makes it an ideal trekking backpack for 2-7 days. In case you want a backpack for more than 7 days, I wouldn’t recommend this one. Its made up of strong and sturdy nylon material that is also water resistant. It’s a light-weight bag (780 gm) but is strong and sturdy because of the robic nylon fibers. Remember this bag is not waterproof but only water resistant. It holds up pretty well in minor rain and few splashes but definitely not in the heavy downpour, therefore, you will need to cover it with a rain cover in case of any rain. Now coming to this mountain rucksack backpack, it’s 75 Liter which is more suited for longer trekking/camping trips. If you’re planning to buy a trekking backpack for a tip of more than 7 days, this one has the right capacity. It has a metal frame that makes it sturdy and durable. It’s made of a Nylon polyester fabric and is water resistant. Also, it comes with a rain cover. Given its large size, it only weighs 1.2 Kg. It has padded shoulder straps that make it comfortable on the shoulder. Also, the slim shape allows a free movement of the hands. Its shoulder and waist straps are adjustable that allows for a better fit when carrying it on trails and mountains. Forclaz which is a brand of Quechua has produced this fantastic backpack that is designed to give maximum comfort with maximum load. Mind you this bag’s volume is 70 Litre and it can carry a truckload of your stuff (which also means that it weighs more than others). If you’re planning a trip for 7+ days, you should consider this 70-liter capacity FORCLAZ backpack. And because it’s 70 L, it always weighs more (1.95 Kg). One of the best things about Quechua backpacks (be it 50L or this 70L) is that it has two pockets on the sides and one on the front which makes it easy to access stuff. This back is a simple yet practical bag with pockets and easy access, practical for occasional hiking and traveling. Let’s come to the practical part – This backpack has a great design due to which you can open this backpack vertically as well as horizontally by opening the zip. There are two big side pockets for keeping your sunscreens, sunglasses and other stuff and one zippered pocket at the top of the bag. You can easily pack your heavy jackets, woolens, caps, socks, and other armory and go on a backpacking trip of 7-10 days. 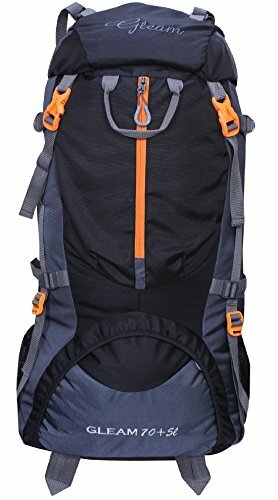 If you trek/hike regularly (once every 2-3 months) then this backpack is recommended for you. Abrasion Resistance: 10-year guarantee. Very hardwearing thanks to the fabric and reinforced seam. 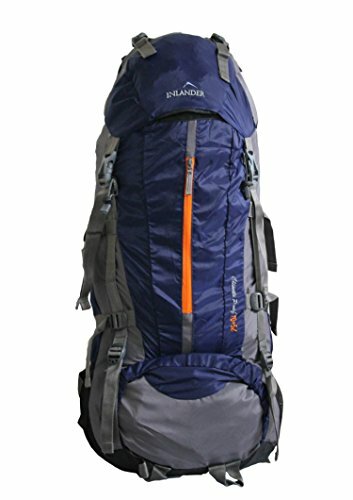 Capacity: Volume 71 liters / Weight 1.9 kg and ideal for 7-10 days trekking or camping trip. This 50-liter Rucksack from Mount Track has padded shoulders straps for comfort, internal pockets to store your gear. It also has fibre padded cushioned back for comfort and back support around town or on the trail. Its slim shape provides freedom of arm movement and stability in situations requiring good balance. The sack bends and twists with you, giving a greater degree of balance; its technical back system is designed for alpine sports and high-grade routes. The soft, specific pressure zones ensure exceptional load /carrier contact. The shoulder straps are also adjustable. These attractively designed packs cover a range of uses. With a range to cater from the summer walker to winter climber or climbing or mountaineering. This Inlander Decamp 1009 backpack has a 70 Liter capacity which makes it suitable for longer trekking/camping trips as well. It comes with multi compartments & pockets on front and sides. It is one of the most stylish rucksacks for adventure & hiking, single comfortable handle with two padded and adjustable shoulder straps, light and durable material, zip closure. Some people who have ordered this bag online claimed that the bag has weak stitching and the material used is not strong. As we have mentioned above that to get a good backpack you will need to spend at least INR 2000 that you can carry with you for the next 3-4 years. 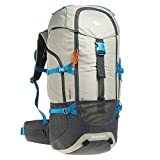 This one is a good option if you are looking for a cheap backpack and a bit short on budget but certainly not the best of the lot. While making a plan for trekking and choosing the backpack you should focus on the size and design of the backpack bags for trekking. This selection for the right backpack for trekking/camping is very important to avoid any kind of inconvenience later and this can also make your trip more enjoyable and memorable. On the other hand, making a wrong selection of backpack bags can bring several kinds of troubles for you like a backache etc. It is also very hard to maintain the proper balance of the body at the time of hiking with improper backpack bag. So you must know the good qualities that a backpack has and how you can obtain a suitable one which can make your trip pleasurable. However, choosing the right backpack is not an easy task and thus you must know some of these most significant tricks to make sure that you are taking the right decision. Firstly, you should check that whether your backpack is comfortable or not. You must make sure that it fits you properly and is easy on your shoulders and back. With this on your back, you must be able to make any movement comfortably. It is much better to have a separate section for everything in it so that you can find items easily without wasting your precious time like camera, woolen cloths, water, snack bars etc. In case you are visiting a water body or rainy place than you must also choose the waterproof backpack. Backpacks with the inner frame are stronger than usual bags and they also support your body due to good structure. The inner frame of the bag also prevents the bag from folding and gives you maximum balance at the time of trekking on high altitude. With a well-balanced body and properly shaped bag on your back, you will be able to make any kind of swift movements as well. There are two types of choices available in the market for backpacks – with pockets and without pockets. There is no thumb rule when it comes to trekking backpacks and thus you have to make this decision on the basis of the nature of the place that is going to visit. In case you need to open the bag frequently to have something than it is better to have pockets because you can exactly get the right item. Mostly trekking bags have pockets so that user can find the things easily and get them conveniently. Personally, I prefer backpacks that have pockets as it allows me to compartmentalize and put stuff that I easily access. There are many options available for you when you are thinking to spend quality of time on your holiday and want something to carry your belongings. You can also consider Rucksacks and backpacking gear. They are available in different storage capacities. On an average, for a single person, 60 liters capacity is the best rucksack and you can carry many things easily. No matter which kind of bag you are choosing but make sure that it must have storage for water bottles. We never know what the situation will be so for the safe side you should also consider this. Make sure that the stuff is strong enough to bear the rough weather conditions. You can also consider the in-built locking system for the safety of your goods. Make sure that you are choosing a bright color as it makes it easier to identify. There are many good backpack brands so you will never have a problem at the time of buying the most economical one for yourself. You should try to put your bedding at the bottom of the backpack and keep the heavy gear such as tent, food, camp stove near the back. Pack your clothes around these items. The groundsheet should be placed under the flap, and the tent beneath the pack if there is no space inside. Always keep a rainproof jacket and your fleece close at hand. Place small items like sunscreen, maps, sunglasses, water tumbler etc. in the pockets. How is your backpack’s volume measured? The volume of a backpack is measured using a standardized method by some adventure companies like wildcraft, Quechua, decathlon etc. They fill the main compartment of the backpack as well as each pocket with little balls. Then all these balls are poured into a graduated container which gives the equivalent volume in a liter. Hope with this useful information you can make a better decision now and we wish you all the best for your happy journey. Related: Essential Items to Carry For Hiking/Trekking in India.